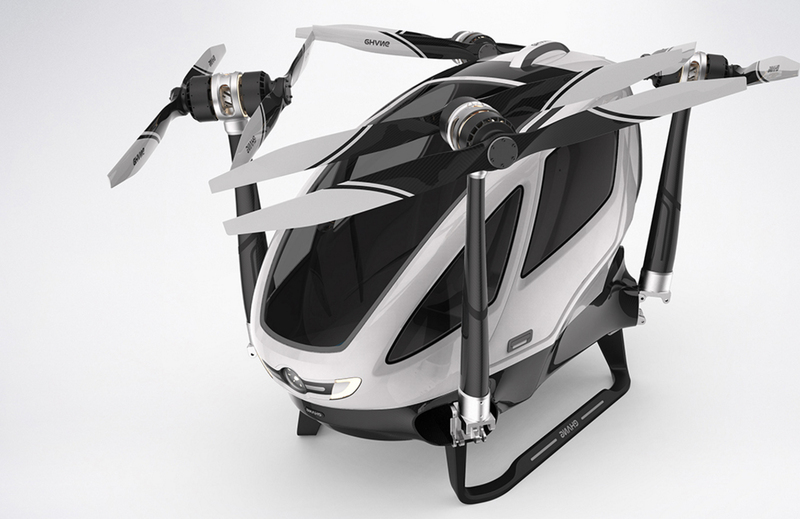 EHang has revealed an electric autonomous areal vehicle at CES this week, the first of its kind. The EHang 184 drone can carry a single person, weighing up to 130kg, to a designated destination. The eight-rotor vehicle doesn’t allow the passenger to control the vehicle, which brings to mind several safety concerns. Similar to the package delivery drones currently being prototyped by Amazon, the EHang 184 is set to an established location for an autonomous flight, rather that being controlled by the passenger. The company claims that the drone has already completed over 100 test flights. They also note that a control centre monitors each flight around the clock with the ability to intervene in an emergency situation. While it may not be commercially ready from a safety perspective, the company has added several other consumer friendly features, including a trunk for luggage and outward folding doors. The drone’s propeller arms can also fold upward for tight storage. The drone can travel at up to 100km an hour and can fly for 23 minutes, according to the company, and the battery takes two hours to recharge. No release date has currently been set.